When we got the keys to our new home on 9th February 2015, the first job on the to do list was investigate whether the asbestos suggested by the building survey was indeed present or not. We didn’t want to take any risks, so we got a specialist asbestos survey organised. This showed that there was indeed asbestos present, in the external soffits insulation board, in the cement for the external downpipes, floor tiles in the bathroom and kitchen and the old kitchen cupboard doors. As some of it was the nasty type of asbestos, we had to use a licenced asbestos contractor. Thankfully, the HSE have a list of all the asbestos licence contractors on their website. It took a bit of searching, but you can find the link here. I got some quotes, which were slightly eye-watering, but found one that seemed reasonable and, more importantly, could slot us in the week we completed our purchase of the bungalow. As we had to budget for rent to live elsewhere while the renovations were done, we needed the project to be completed as efficiently as possible. The house as it looked when we got the keys, before the asbestos was removed. As the asbestos removal had to be in line with the CDM 2007 Regulations, the contractors had to use a tent to enclose the whole house to present fibres escaping, carry out air testing and provide certification to provide assurance that it had been done properly. They also had to semi-demolish the old glass conservatory at the back of the house and remove some plants from the front garden. 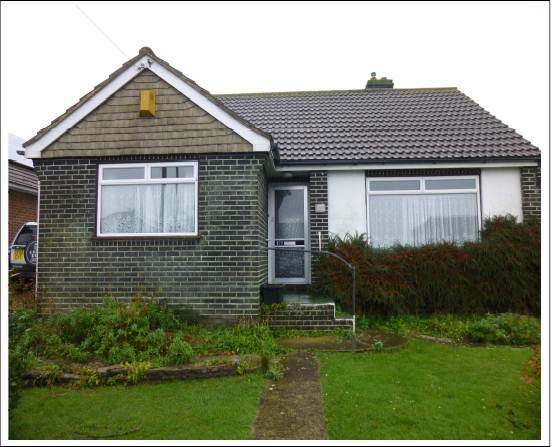 It was all worth it though: in two days we got the keys to the bungalow when the sale completed and all the asbestos safely removed. Now the renovations could begin in earnest!